It's a film that does the horror genre proud. It's original and inspite of being a horror film, there is not even one creaky door in the length and breadth of the film. Yes, portions of the film are clumsy and embarrassing, specially the way the youngsters at the prologue are shown to talk. Why must all the 19 year olds talk with "dudes" and "bros" thrown in like noodles in a chicken dish? Fortunately, 3 A.M. doesn't rely on too many external props to wean us in its favour. It stays true to the horror genre without buckling under the pressure of perpetuating terror. The frights flow naturally. I was specially fascinated by one sequence in the beginning where Rannvijay, playing a television software maker, wakes up in the middle of the night to see his girlfriend (Anindita) sobbing next to him. A few minutes later he gets a call saying she's dead. Scary? Yes, quite a bit. In the film, the director keeps the goings-on largely edgy and creepy, though the one-setting milieu does get tedious at times there is always something happening on screen to keep us from falling out. The film creates an aura of foreboding without resorting to the clich?s of the horror genre. The plot about a chap's bereavement and his ferocious encounter with the after-life is mainly restricted to a run-down (read: haunted) mill. That's where the narrative lives and breathes to its last. The camera circles the desolation eerily. Trouble starts when the director conspires to take the plot out of its naturally chilling habitat. There is a specially intrusive Goan episode pumped into plot at a time when the ghouls get going in a big way. The problem with the horror genre in Hindi is that it doesn't know where to get off. This one doesn't overstay its welcome. The twist in the tale where Rannvijay turns out to be what he doesn't want us to know, is not novel. The treatment to a large extent, is. The camera movements (Vijay Misra) in the fright-inducing scenes are fluid but controlled. Raju Singh's background score is tempered by a sense of self-directed surprise, as though the music was as taken by surprise by the goings-on as the audience is expected to be. The special effects are toned-down and done effectively. Most of the time 3 A.M. cruises along exploring the bond between this life and the afterlife without getting tangled in spiritual polemics. Miraculously the horror film avoids the excesses of the genre. It's done in tempered-down tones and the storytelling tapers down to a well thought-out finale. 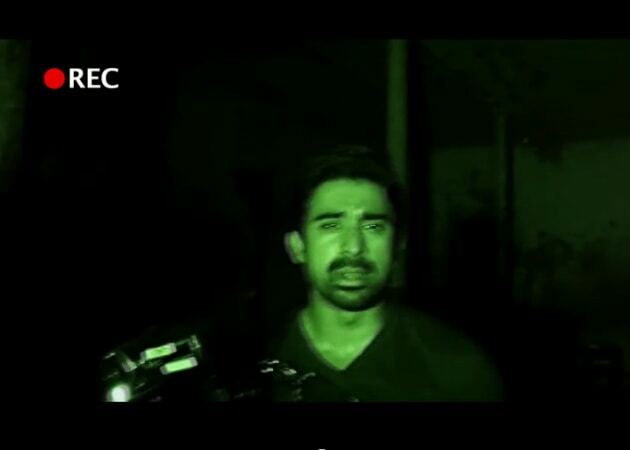 Rannvijay sells spook with conviction. He expresses the helplessness of bereavement like a man who has seen mortality from close quarters. I have to mention a shot where Salil, now royally possessed runs across the frame on all fours like a wild boar. The body language is terrifying. The film is a sharp slick scare-fest. It delivers the fear quotient without resorting to cheap gimmicks or excessive gore.